Feedstock is a raw material which is used in the industrial process in order to generate energy .It is used to generate petroleum products. Crude oil is used in a refining process in order to get gasoline. Petroleum liquid feedstock is combination of various types of hydrocarbons that are highly flammable and volatile and are obtained by the distillation of petroleum, coal and wood. It is also known as petroleum naphtha, coal naphtha and wood naphtha. The distillation of petroleum products and crude oil separates the crude oil from the hydrocarbon group. The petroleum liquid feedstock enables easy storage of various types of chemical that are not easy to handle. The petroleum products are transformed into operational products by altering their physical and chemical structure by cracking process. The various applications of petroleum liquid feedstock include fuels and gasoline. The other application includes production of petrochemical products such as propylene and ethylene. The global petroleum liquid feedstock market is anticipated to expand at a significant CAGR during 2018-2027. It is projected to reach significant market size by 2027. The increasing consumption of various petroleum products is anticipated to increase the market growth of the global petroleum liquid feedstock market during the forecast period. The global petroleum liquid feedstock market can be segmented on the basis of type, application and product type. On the basis of type, it sub-segmented into heavy naphtha and light naphtha. Heavy naphtha is anticipated to increase at the fastest rate on the account of its application in the heavy refineries for the production of petroleum products. On the basis of application, it is sub-segmented into industrial solvents, gasoline, cleaning fluids, adulterant to petrol and others. Gasoline sub-segment is anticipated to be the fastest developing sub-segment on the account of increasing usage for household and commercial purpose. On the basis of application type, it is sub-segmented into ethylene, benzene, propylene, hexane, naphthalene and others. The expanding automobile industry leads to high usage of the petroleum liquid feedstock. 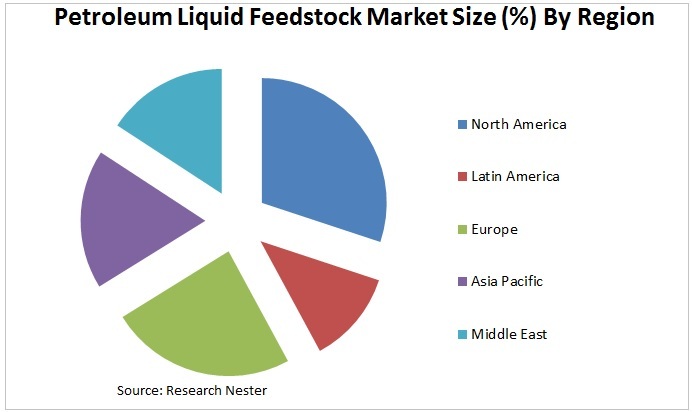 The increasing domestic transportation such as motor vehicles and increasing marine activities is also a major growth driver for the petroleum liquid feedstock market. The increasing industrial and commercial activities across the globe are anticipated to increase the demand for the petroleum product. This in turn is anticipated to drive the global petroleum liquid feedstock market. Additionally, increasing application of heavy naphtha in the aromatics and gasoline is also expected to fuel the market growth throughout the forecast period. However, decrease in oil prices across the globe is a major restraint for the global petroleum liquid feedstock market during the forecast period. The rising environmental concern regarding the use of petroleum products is also expected to hinder the global petroleum liquid feedstock market.